The Terra Foundation Library of American Art is Europe’s only research facility devoted exclusively to the historical art of the United States and transatlantic artistic exchange. The Terra Foundation’s Library of American Art in its Paris Center is the only research library in Europe devoted exclusively to the visual arts of the United States. Opened to the public in 2009, it provides access to more than 10,000 books and exhibition catalogues on American art from the eighteenth century to the 1980s, with a special emphasis on nineteenth- and early twentieth-century art and artists, as well as transnational artistic exchange. A non-circulating research facility, the library welcomes an international community of readers, in particular students, researchers, curators, professionals, and the art-interested public. 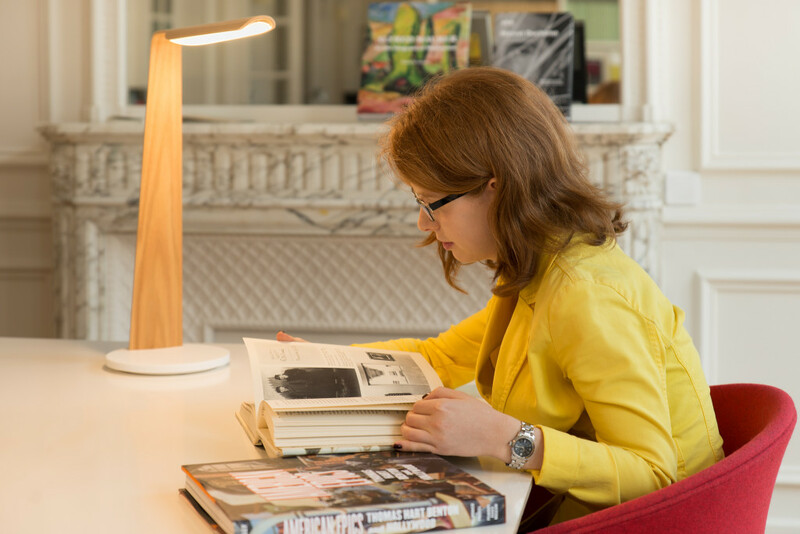 Since its opening, the library has developed partnerships with leading Paris art libraries, including the Institut National d’Histoire de l’Art, the Bibliothèque Kandinsky at the Centre Pompidou, and the Deutsches Forum für Kunstgeschichte. Holdings comprise book publications on the media of painting, sculpture, photography, graphic arts, and decorative arts, as well as publications in the areas of cultural history, history, and literature. Hard copies of journals do not form part of the collection but are accessible through digital databases. Copies of curatorial object files of the Terra Foundation collection may be consulted by appointment. Digital resources such as JSTOR, ARTSTOR, American Periodicals Series (ProQuest), and International Bibliography of Art (ProQuest) are available for onsite consultation. New acquisitions focus on recent publications representing the best scholarship on American art today. One of the current priorities of the library’s collection development are books on American art published outside the United States in a variety of languages. While the complete library holdings are accessible through the online catalogue, a large part of the holdings can also be searched through the French academic union catalogue SUDOC, as well as Worldcat and Google Books. 1992: Creation of a curatorial library of 3,500 volumes on the occasion of the opening of the Musée d’Art Américain Giverny (MAAG). New acquisitions and gifts linked to exhibitions and public programs supported by the Terra Foundation gradually enrich the initial holdings over the years. Fall 2009: The library opens its doors to the public at the Terra Foundation Paris Center on the rue des Pyramides. 2010: An extraordinary gift by the estate of Roger Breed Stein, professor emeritus of the History of Art at the University of Virginia, adds a special collection of 3,000 volumes in the fields of American history, literature, and visual culture. 2012: Holdings are displayed in SUDOC (Système Universitaire de Documentation), Worldcat, and Google Books. 2015: The Terra Foundation Paris Center & Library moves to its current location in the 7th arrondissement. The reading room is now shared with the Fondation Custodia library, the second largest art history library in France, whose holdings of 130,000 volumes cover Western art history, with a special emphasis on Flemish and Dutch art, as well as the history of collections and collecting.